Casio Musical Instruments - Andertons Music Co.
Casio offer a fantastic range of affordable pianos and keyboards to suit every stage in a pianist's journey. Featuring keyboards with built-in lessons for the beginner, to professional digital pianos with a real Bechstein Piano action! 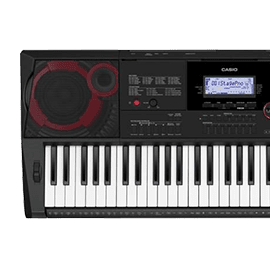 Whilst many may associate Casio for their calculators and as the go-to watch brand for under 15s, they have actually built up an excellent range of pianos and keyboards to suit both beginners and accomplished players. If you're just starting out, Casio keyboards feature a massive range of sounds and backing tracks to explore, and built-in lessons so that you can learn and progress outside of regular tuition. For more seasoned players, Casio offer a wide variety of authentic-sounding digital home pianos and stage pianos to suit your budget. At the top end of the range, Casio collaborated with acoustic piano designer Bechstein to create their digital hybrid pianos that actually feature the authentic action and feel of a real acoustic piano. 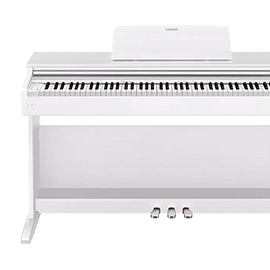 At Andertons, we offer 0% Finance over £300; plus we have some fantastic piano and keyboard bundles so that you can save money when buying a full setup with a stool and headphones. Casio was established as an electronics company in 1946, by an engineer called Kashio Tadao. It rose to fame originally with its compact calculators, however Casio have created a wide range of different products in their long history including, printers, mobile phones, wristwatches, cameras, computers, as well as a range of musical instruments. The first instrument came in January 1980 with the Casiotone CT-201. Whilst it wouldn't amaze people with it's realism, it was the first of many Casio keyboards to offer beginners an affordable and fun keyboard option when learning the piano. Their first Synthesizer was released in 1984 with the CZ-101, and unlike those early keyboards, it still holds up well today! 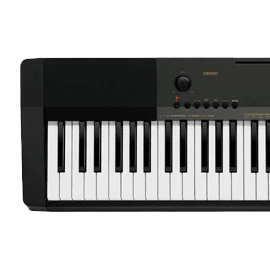 Casio started to build on their piano range with the Celviano full digital piano in 1991, and the stylish and affordable Privia digital pianos launched in 2003. During this time they have continued to build and improve the technology. Their latest technology "A.I.R" sound source recreates the rich, resonating tones of a real acoustic piano. This sound quality and performance is even strong enough to challenge the long-standing dominance of notorious competitors; it's just a matter of personal taste! Most recently, in 2015 Casio released their Grand Hybrid range, working in collaboration with Bechstein to create a digital piano with a real acoustic piano action. This new hybrid piano gives you all the benefits of digital, like staying in tune and the option of different tones, but you still get the authentic feel and response of a real acoustic piano. It's the ultimate in digital piano design and technology. Casio offer a number of different options to suit your budget and needs. Here's a rundown of the different ranges. Privia is Casio's selection of slimline digital instruments for beginners and intermediates. 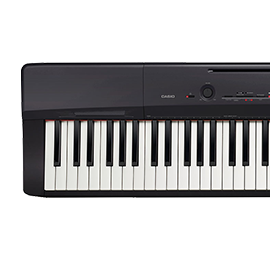 The Privia range encompasses many of Casio's stage pianos and performance keyboards as well as compact modern instruments for the home. They're perfect for compact living spaces and boast a fantastic range of tones and features. 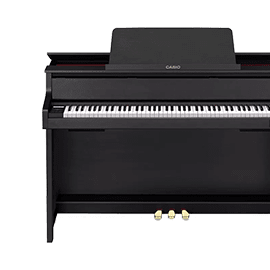 Celviano represents Casio's high-end piano range, featuring a stylish upright piano design, high-quality "A.I.R" sound engine and Tri-sensor Keyboard action for excellent feel and tone. The Flagship Celviano Grand Hybrid pianos are a step above the rest, with full Bechstein hammer action for the ultimate in authenticity. Casio 9.5V PSU for SA46, CTK240 etc.